Sales of video game software and hardware plummeted in April, shocking industry observers who were expecting the numbers to be slightly positive or, worst case, down just slightly. That could mean a rough Friday for video game stocks. On the whole, sales were off 26 percent to $766 million, with software sales (the most closely followed of the numbers) plunging 22 percent to $398.5 million, according to NPD Group, which tracks video game sales. Because April 2009 had relatively light sales (and thus, an easy comparable) industry insiders and investors were hoping to at least tow the line. It was the industry’s fourth worst year-over-year decline—and it puts overall sales 11 percent behind last year’s sluggish pace. Michael Pachter of Wedbush Securities, who had expected the numbers to climb 2 percent, agrees that the retailer will be particularly vulnerable. Hardware sales were even more discouraging than software, falling 37 percent from a year ago to just $249.3 million. 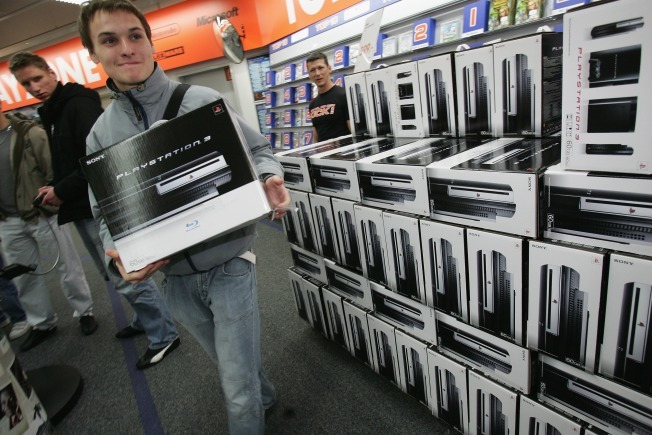 The Nintendo Wii remained the top seller, but only moved 277,200 units. Sony’s PS3 and Microsoft’s Xbox 360 were relatively neck and neck, selling 180,800 and 185,400 respectively. The handheld Nintendo DS system sold fewer than 441,000 units, despite the launch of a new version of the platform at the end of March. When compared to the March numbers, Sony’s hardware sales were off 48 percent, Microsoft’s were down 45 percent, and the Wii tumbled 50 percent. “In April '09, consumers attributed $55 million of industry sales to Easter as a purchase occasion, which would account for about 21 percent of the decline from last year since Easter purchasing happened in March this year," says NPD analyst Anita Frazier. The weak numbers could increase calls for both hardware and software price cuts this year. Many analysts are expecting Microsoft and Sony to lower the price of their machines before the end of the year, which could force Nintendo to react as well. Don’t, however, look for the companies to move up those cuts on the April figures alone. Last month’s big titles saw precipitous dropoffs. Sony’s “God of War” dropped from over 1.1 million copies sold in March to just over 180,000. Nintendo’s Pokemon SoulSilver Version sold over 1 million copies in March, but dropped to 243,000 last month. Ubisoft had the month’s biggest game with “Splinter Cell Conviction”—selling over 486,000 copies. That’s a respectable number, but hardly a barn burner.